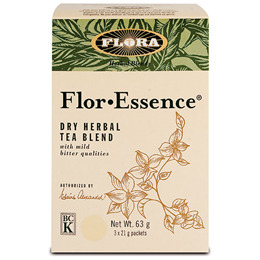 Flor Essence also contains high levels of anti-oxidants, which help support the body. Flor Essence also helps support and maintain the immune system, enhancing the body`s ability to defend itself against illness. The active components in the herbs contained within Flor Essence also help support and maintain a healthy digestive system. When in full health the digestive system will help cleanse the intestinal organs, removing `sludge` that prevents full absorption of vital nutrients. Flor Essence can contribute to a healthier digestive system, which will help keep food from fermenting in the intestinal tract and from becoming a source of toxins. The results are healthier, toxin-free cells, as well as improved digestion, optimal health and vibrant energy. Ideally, take on an empty stomach before bed, and half an hour before breakfast. Wait at least half an hour before eating or drinking. Sip slowly. Swish around in mouth like mouthwash (to absorb maximum benefits) before swallowing. Dilute tea with an equal or double amount of unfluoridated, purified hot water. Adult Daily Maintenance/Preventive: Measure out a half to 1 oz. (14-28ml) of tea twice daily. Adult Extra Strength: Measure out 2 oz. (56ml) of tea twice daily. Children (2-12 years of age): Measure out three quarters to 1 oz. (21-28ml) of tea twice daily. Infants (under 2 years of age): Measure out a quarter to half an 1 oz. (7-14ml) of tea twice daily. Below are reviews of FMD Flor Essence Detox Tea - 63g Powder by bodykind customers. If you have tried this product we'd love to hear what you think so please leave a review. Much more economical than the ready made concentrate, I managed to follow the instruction to carefully prepare the essence. Pleased it doesn't taste bad at all for the benefit you get! After 2 days my sinuses were not blocked in the mornings. Thick mucus disappeared over the week. Noticed the easing of carpal tunnel syndrome within 5 weeks, a return of smells that had disappeared from my spectrum and an easing of my arthritic finger joint. Now there is nothing left to fix. Unless my infrequent but strong migraines perhaps will not re-appear, either? I heartily recommend this herbal wonder. I do not like to take pills, I'd rather live with low level discomfort and inconvenience. But this won't be necessary any more. Flor Essence is a superior detoxifying herbal tea made from a traditional formula of eight herbs, Red clover, Kelp, Blessed thistle, Slippery elm, Turkish Rhubarb, Sheep Sorrel, Watercress & Burdock root.